In 1855, the good citizens of the state of New York faced this very prospect. Since the birth of the republic, alcohol and Independence Day have gone hand in hand, and in the early nineteenth century alcohol went hand in hand with every day. Americans living then downed an average seven gallons of alcohol per year, more than twice what Americans drink now. In homes and workshops, churches and taverns; at barn-raisings, funerals, the ballot box; and even while giving birth — they lubricated their lives with ardent spirits morning, noon, and night. If there was an annual apex in this prolonged cultural bender, it was the Fourth of July, when many commemorated the glories of independence with drunken revelry. Beginning in the 1820s, things began to change. A rising lot of middle-class evangelical Protestants hoped to banish the bottle not only from the nation’s birthday but from the nation itself. With the evidence of alcohol’s immense personal and social costs before them, millions of men and women joined the temperance crusade and made it one of America’s first grass-roots social movements. Reformers demonized booze and made “teetotalism” (what we call abstinence) a marker of moral respectability. As consumption levels began to fall by mid-century, activists sought to seal their reformation with powerful state laws prohibiting the sale of alcohol. They insisted — in true democratic fashion — that an overwhelming majority of citizens were ready for a dry America. State legislators played along, initiating America’s first experiment with prohibition not in the well-remembered 1920s but rather in the 1850s. It was a time when another moral question — slavery — divided the nation, but it was also a time when hard-drinking Irish and German immigrants — millions of them Catholics — threatened to overwhelm Protestant America. With nativism in the air, 13 states enacted prohibition laws. Predicting the death of alcohol and the salvation of the nation, temperance reformers set out to see these laws enforced. New York’s moment came in 1855. The state legislature passed a prohibition statute in the spring and chose the Fourth of July for the measure to take effect. If prohibition was going to work, it had to work on the wettest day of the year. The bold timing was not lost on contemporaries who imagined the “sensation” that would undoubtedly accompany a dry Independence Day. “Cannon will have a novel sound in the ears of some people” and “flags will have a curious look to some eyes,” the prohibitionist New York Times jibbed. American eyes and ears, of course, had long been impaired by “brandy smashes” and “gin slings.” But now a proper, sober celebration of the nation’s birth could proceed without alcohol’s irreverent influence. 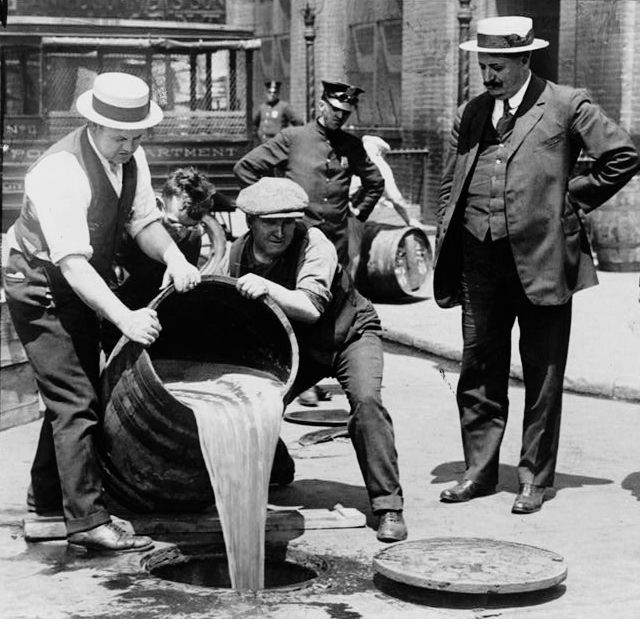 Laborers dispose of liquor during Prohibition. Public domain via Wikimedia Commons. A stiff cocktail of workingmen and entrepreneurs, immigrants, and native-born Americans, however, burst on to the scene to keep the Fourth of July, and every day thereafter, wet. These anti-prohibitionists condemned prohibition as an affront to their cultural traditions and livelihoods. To them, prohibition exposed the grave threat that organized moral reform and invasive state governments posed to personal liberty and property rights. It revealed American democracy’s despotic tendencies — what anti-prohibitionists repeatedly called the “tyranny of the majority.” Considering themselves an oppressed minority, liquor dealers, hotel keepers, brewers, distillers, and other alcohol-purveying businessmen led America’s first wet crusade. In the process, they became critical pioneers in America’s lasting tradition of popular minority-rights politics. As the Fourth of July approached, they initiated opinion campaigns, using mass meetings and the press to bombard the public with anti-prohibitionist propaganda that placed minority rights and constitutional freedom at the heart of America’s democratic experiment. They formed special “liquor dealer associations” and used them to raise funds, lobby politicos, hire attorneys, and determine a course of resistance once prohibition took effect. In some locales their public-opinion campaigns worked as skittish officials refused to enforce the law. As the New York Times grudgingly observed of the Fourth of July in Manhattan, “The law was in no respect observed.” But elsewhere, officials threatened enforcement and reports of a dry Fourth circulated. In Yonkers, for example, there wasn’t “a drop of liquor to be had.” With prohibition enforced in Brooklyn, Buffalo, and elsewhere, anti-prohibitionists implemented their plan of civil disobedience — intentionally and peacefully resisting a law that they deemed unjust and morally reprehensible. They defiantly sold booze and hoped to be arrested so they could “test” prohibition’s constitutionality in court. Liquor dealer associations organized these efforts and guaranteed members access to their legal defense funds to cover the costs of fines and litigation. The battle had fully commenced. In New York, as in other states, anti-prohibitionists’ activism paid off. Their efforts soon turned prohibition into a dead letter throughout the state, and they convinced New York’s Court of Appeals to declare prohibition unconstitutional. The Fourth of July had been a dry affair in many New York towns in 1855, but anti-prohibitionists ensured that the national birthday in 1856 was a wet one. Their temperance adversaries, of course, would persist and emerge victorious when national Prohibition in the form of the 18th Amendment took full effect in 1920. But anti-prohibitionists continued to counter with tactics intended to protect civil liberties and minority rights in America’s democracy. That Independence Day today remains a wet affair owes much to their resistance and to the brand of minority-rights politics they popularized in the mid-nineteenth century. Kyle G. Volk is Associate Professor of History at the University of Montana. He is author of Moral Minorities and the Making of American Democracy, recently published by Oxford University Press.